for the Narutofan.com 2004 Holiday Art contest. What i lack in talent I make up for is SARCASM. i wonder if sasuke recognizes his nii-san? if he doesn't then, he must have never seen him on christmas time. it's funny! i never thought sasuke believed in santa! i bet that after shippuuden, he's saying "i want nii-san back" to santa. cool. ^_^ i do almost the same, but only i use a differnt program. omg I love it <3 Itachi-San looks good in the santa outfit. Lol Itachi is so scary and yet... there somthing about him that makes u want to go . Lol! santa itachi, kill sasuke for me? Ita-kun in a Santa suit! The untimely death line sounds like what stewie would have said. it is actually, lol! it was a strange day when I drew this. Hahahahahaha!!! I love it! So Uchiha Christmas-ie. Fairy Princess SasukeNaruto laughed. "Y-YOU TOOK BALLET?" 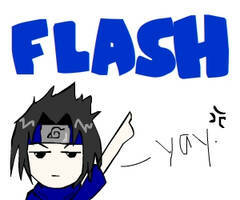 Sighing, Sasuke explained again, "Yes Uzumaki, I took ballet. All Uchiha's did. It improves co-ordination, makes movement easy, and makes learning fighting moves that much easier." Sakura was trying hard not to imagine Sasuke in a tutu, and failing miserably. She broke out into a fit of giggles. For some reason, this irked Sasuke the most; he'd hoped Sakura would've been more mature and understanding. Obviously he was mistaken. "It's perfectly reasonable you two. If I had the chance to, I would've gone into dancing. Unfortunately, I could never keep a beat." Kakashi scratched the back of his head; Sasuke didn't miss the amusement laced through his voice and shot him a dirty look. "I went to one of your recitals once." He said matter-of-factly. Sasuke got a bad feeling at the pit of his stomach. "It was The Nutcracker wasn't it?" Sasuke's bad feeling increased. Politely, Sakura asked, "how was it?"